Makefile Ansuman Banerjee Arijit Bishnu Debapriyo Majumdar Data and File Structures Lab M.Tech. Computer Science 1 st Year, Semester I Indian Statistical. 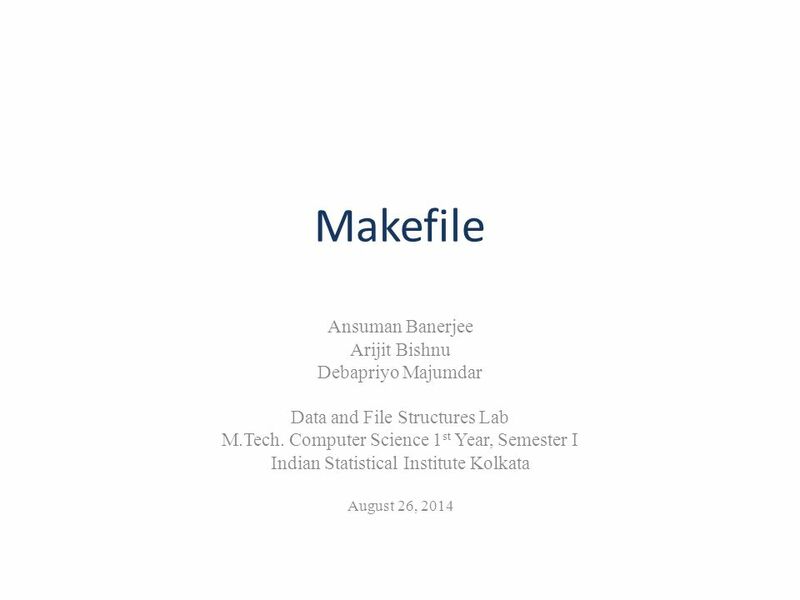 Download ppt "Makefile Ansuman Banerjee Arijit Bishnu Debapriyo Majumdar Data and File Structures Lab M.Tech. Computer Science 1 st Year, Semester I Indian Statistical." Compiling. 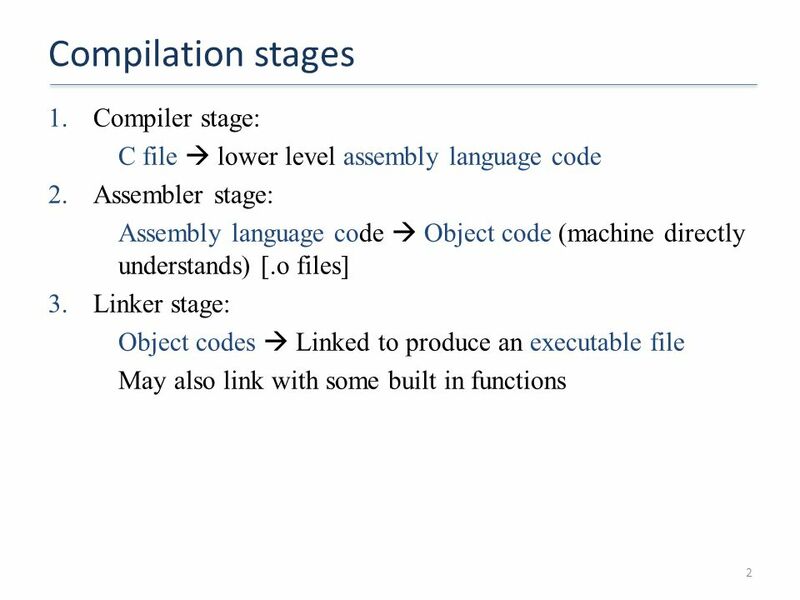 Your C, C++ or Fortran program won’t work unless you compile it The compiler will build your program as an executable file (typically in the. 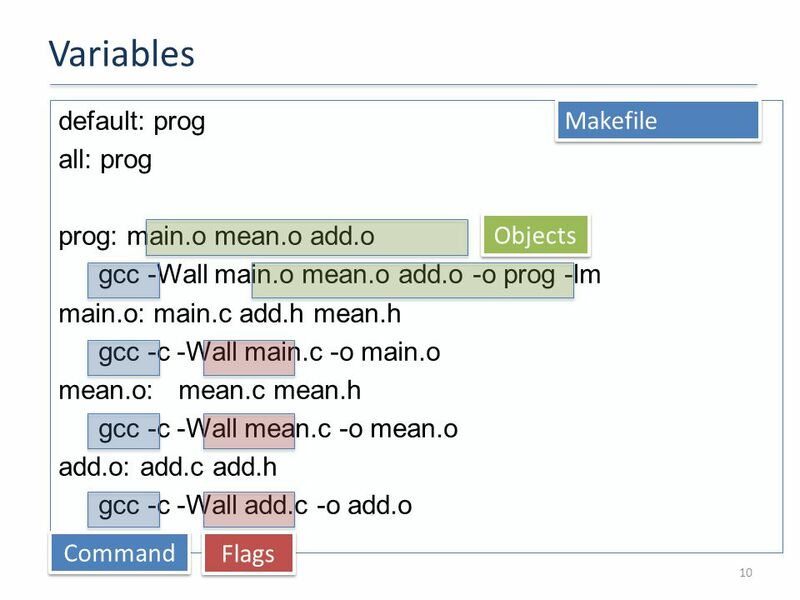 Makefiles. 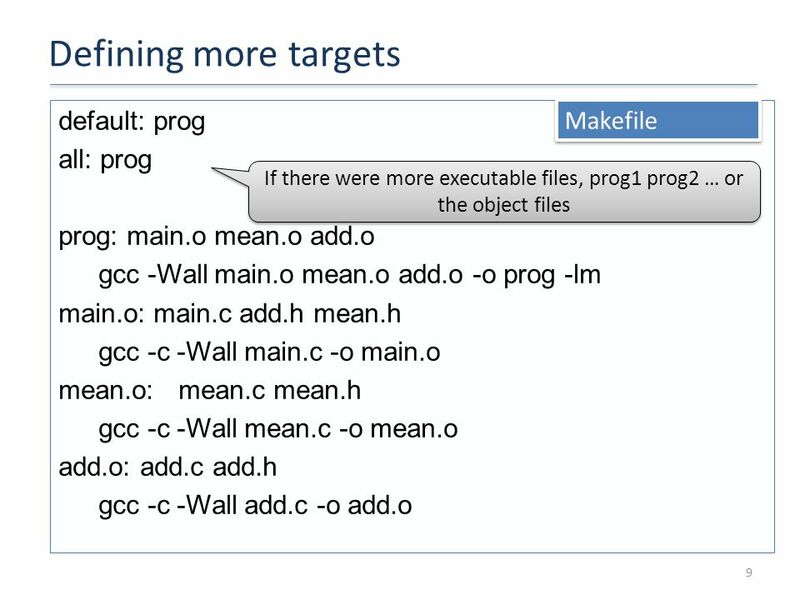 makefiles Problem: You are working on one part of a large programming project (e. g., MS Word). 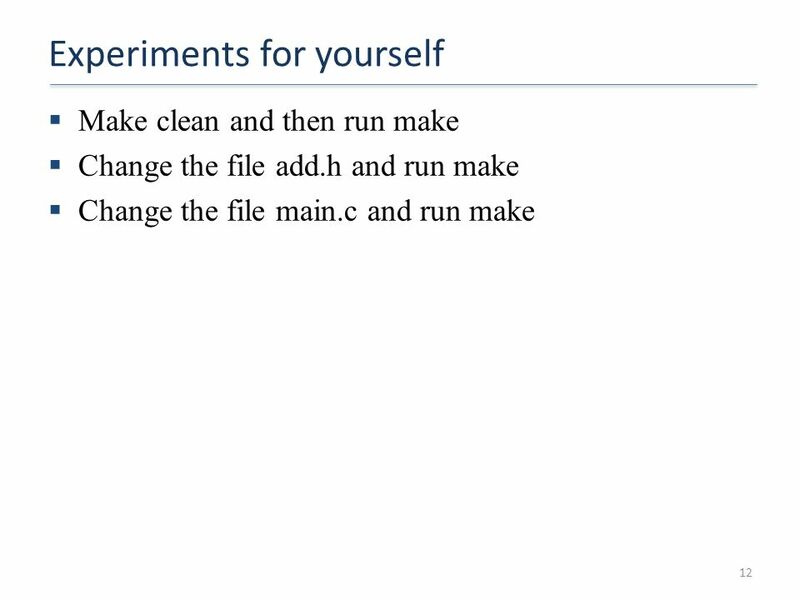  It consists of hundreds of individual.c files. IT253: Computer Organization Lecture 6: Assembly Language and MIPS: Programming Tonga Institute of Higher Education. Separate compilation Large programs are generally separated into multiple files, e.g. 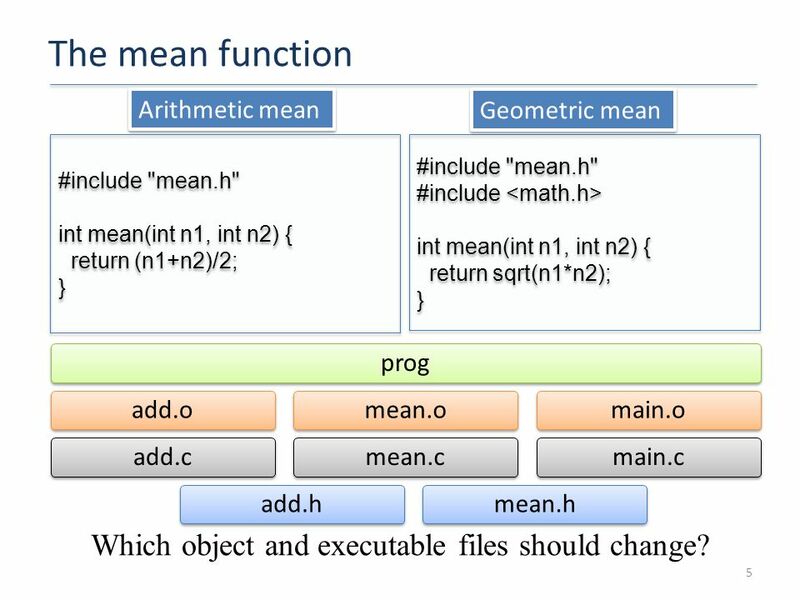 tuples.h, ray.h, ray.c, tuples.c main.c With several files, we can. 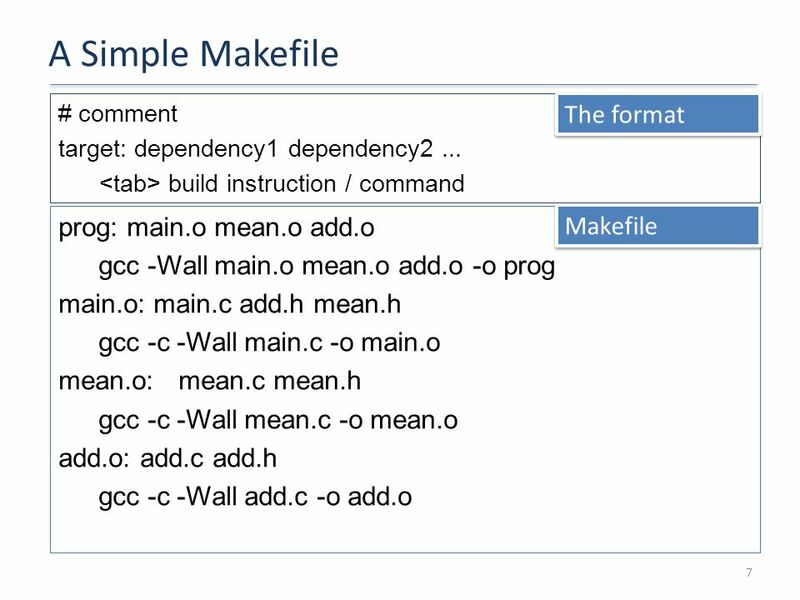 The Makefile utility ABC – Chapter 11, Motivation Small programs single file “Not so small” programs : –Many lines of code –Multiple components. 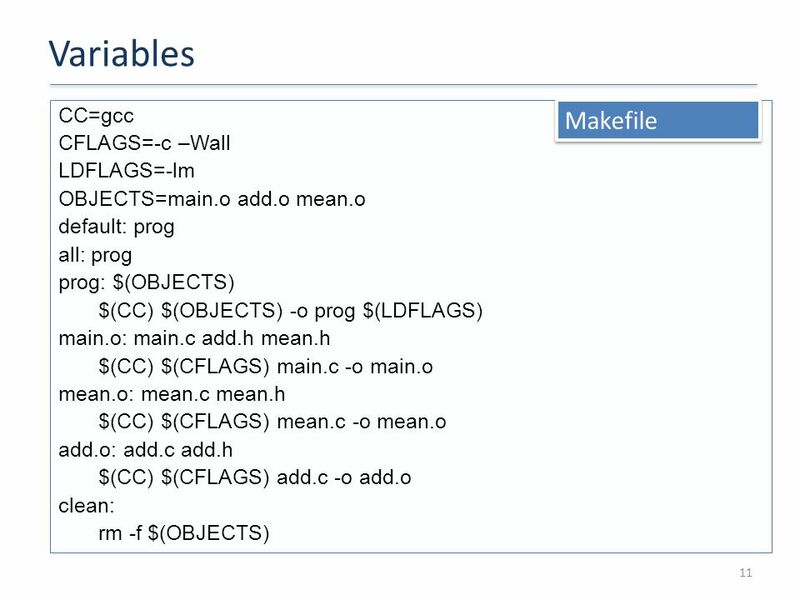 Makefiles Tutorial adapted from and myMakeTutorial.txt. Understanding Makefiles COMP 2400, Fall 2008 Prof. Chris GauthierDickey. Systems Dev. Tutorial II: Make, utilities, & scripting Recitation Wednesday, Sept 13 th, 2006. 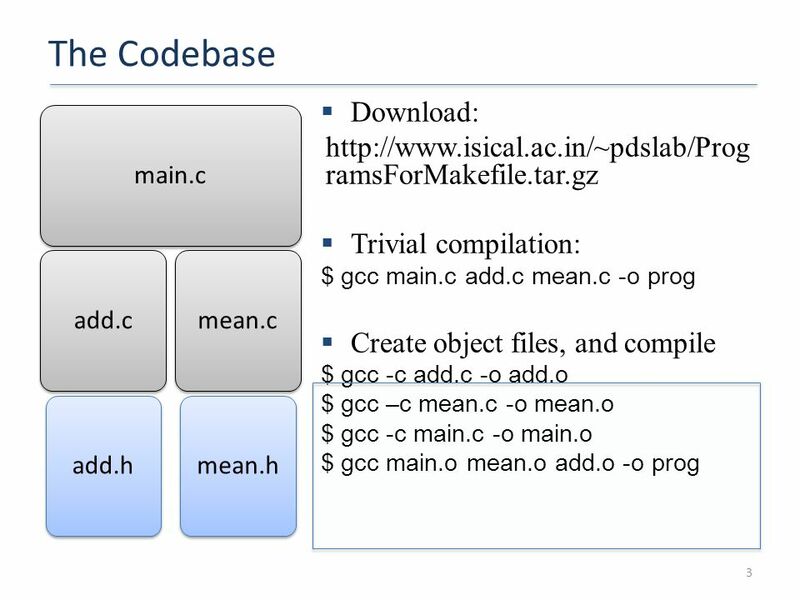 1 CS 201 Makefile Debzani Deb. 2 Remember this? 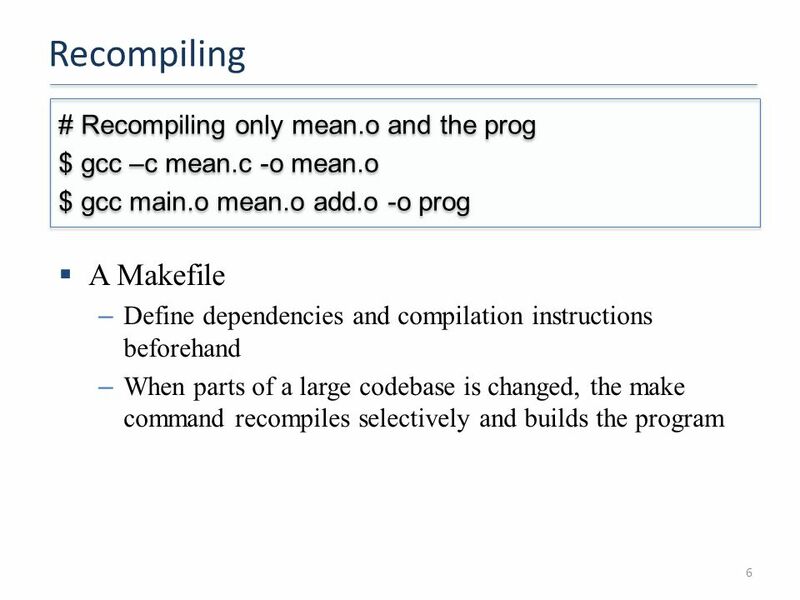 3 What is a Makefile? 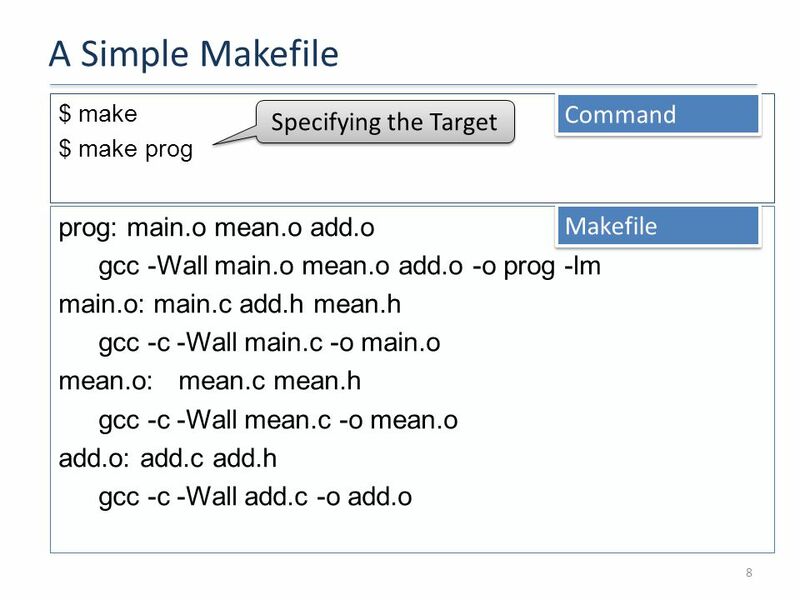 A Makefile is a collection of instructions that is used to compile your program. 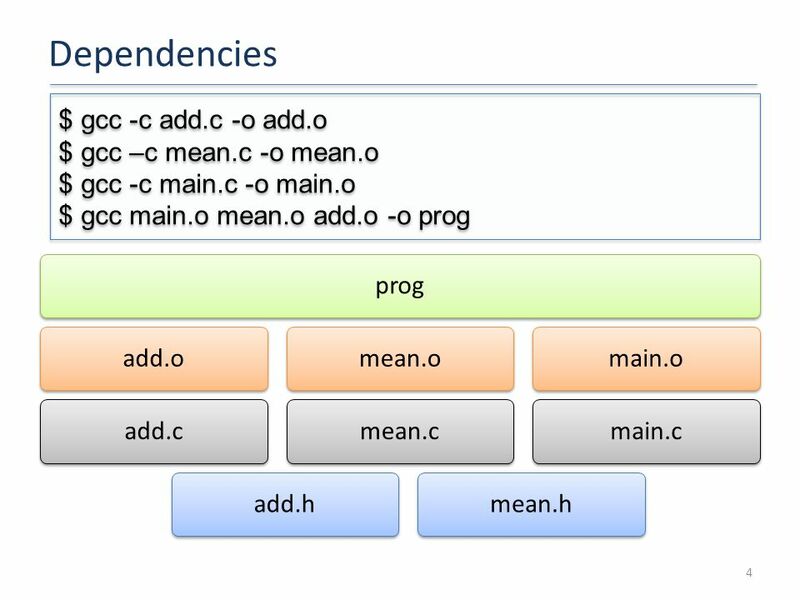 Problem Solving With C++ Recitation – make February 2016.